Kit or Single Products - Which is Best? Describing acne as a curse is very apt. There’s no better way to describe it. It negatively affects our confidence and how we perceive ourselves and, if that wasn’t bad enough, it can also be quite difficult to permanently rid of this bacterial ailment. However, it is indeed possible to remove this affliction from your life, and the most sure fire way of doing this is to find yourself a top of the range treatment product. During our research into the best treatment options, we tested and researched numerous products and treatment plans. Of all these products, the treatment provided by this company was the one that stood out above all others. Therefore, please enjoy my review of this product – hopefully it’ll help you with your own problems. 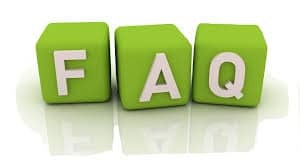 As always, if you have any queries or insights then please feel free to post a message at the bottom of the page. Before I dive into my review let me first describe what exactly these kits are and what should be included in them. There are a few key items that are absolutely vital components of a top treatment kit – without these components the overall effectiveness of the kit will be limited. As I go through each key component, I’ll also give my verdict on whether the brand's kit ticks the boxes in terms of the individual pieces being included as well as the quality of these pieces. The cleanser is the first thing that goes onto you face when you're beginning an acne treatment session. Its job is to cleanse you face of any unwanted substances and to pave the way for the serum. 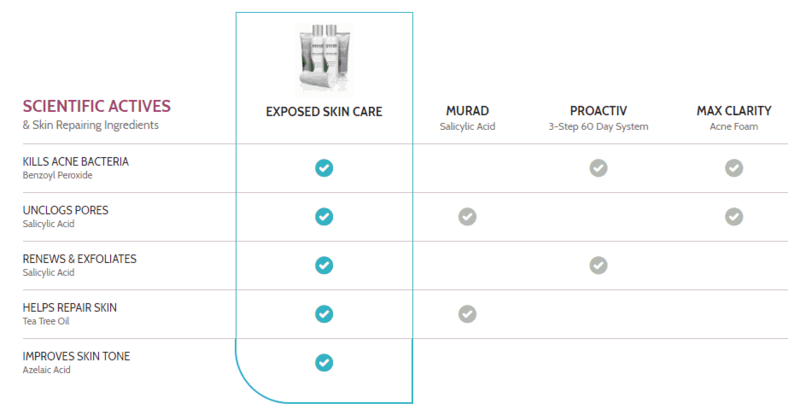 The Exposed cleanser is based on a 0.5% concentration of Salicylic acid and comes in a 120ml bottle. I find that this is an ideal dosage for cleansing your face without causing any irritation. This cleanser is also paraben-free which is the preferred formulaic choice in today’s world. This cleanser is very gentle in terms of its application which expedites the whole process. The toner is the next item that is used in the treatment process and works in conjunction with the cleanser – it further prepares your face for the acne serum. Toners are a necessary additional cleansing step if you have oily skin or suffer from severe acne. It supplies an extra method in which you can rid your face of dead skin cells, dirt, and excess oil/sebum. This toner comes in a 120ml bottle which, as with the cleanser, is a very generous amount. It is based on a 1% concentration of salicylic acid – a perfect percentage in which to prepare your skin for the coming serum. The great thing about this toner is that it’s 100% natural in terms of its formula, something that is always preferable. The toner is stuffed full of herbal extracts. An example of this is witch hazel which is key as it soothes your skin and prevents irritation. This toner is also paraben-free and, just as importantly, it’s alcohol free. Alcohol is an extremely good cleanser…in fact, it’s too good! It cleans off everything and leaves your skin completely dried out and lacking hydration. Alcohol also causes an overproduction in oil/sebum which enhances the spread of acne vulgaris. In other words, NEVER choose a product with alcohol in it! I found this toner very soothing and a great companion to the cleanser. The serum/gel is where things get serious! You’ve cleansed your face thoroughly through the cleanser and toner one-two. So it’s now time to attack that pesky acne with a top grade serum. This serum is based on a 3.5% concentration of benzoyl peroxide which is an ideal solution for combatting this particular affliction without causing any adverse effects to your skin. It comes in a 50ml bottle. There are higher percentages out there, but I find that this is just a bit of a gimmick that can actually be harmful for your skin. Some brands like to promote their product as having a higher percentage which means quicker results, but this really isn’t the case. A higher percentage could actually be too much for your skin to handle. My advice is to go for a milder does over a longer, sustained period of time rather than a super strong dose – beating acne doesn’t happen overnight, no matter what the branding might say!! So, you’ve cleansed your face and attacked that hated acne, what’s next? It’s now time to allow your face to heal and to replenish it with the necessary hydration and nutrients that will maximize the healing process. This is where a quality moisturizer comes into the equation. This moisturizer comes in a 70ml bottle that I believe is a top grade moisturizing agent. 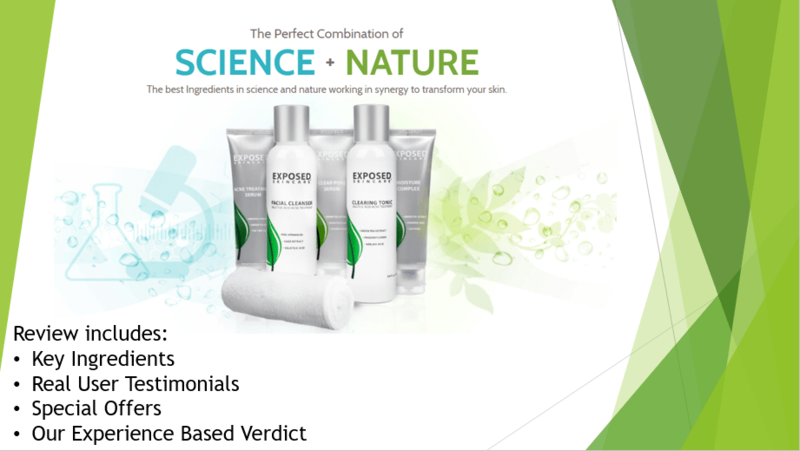 It works superbly to counter the drying effects of the previously used creams. The moisturizing stage of a treatment plan is absolutely key as your skin will need instant re-hydration after the use of the cleanser, toner, and serum. The moisturizer supplied in their treatment kit is very light and non-greasy in terms of consistency. This is ideal as it can therefore be applied and absorbed by your skin in no time whatsoever. As with all the elements of this kit, the moisturizer is also paraben-free. I’d like to make a special mention of the use of pumpkin seed extract and caffeine in the formula as these agents work to calm any skin irritation or inflammation. The addition of green tea extract also provides your skin with vital antioxidants. With regards to the extra serum, this is something that is always a welcome addition. The serum is the star of the show when it comes to the actual treatment as it’s the element of the kit that combats the acne. Therefore, the fact that the good people in this company add in a little extra serum is definitely a much appreciated bonus. The microdermabrasion cloth is also quite a handy addition to this Kit. This cloth adds to the cleansing aspect of the treatment and is a big step up from using a plain face cloth. An important thing to note about this cloth is that you should make sure to wash it after every two or so uses. Otherwise the dirt will build up on the cloth surface and make it ineffective. As with every health and beauty product, the formula is key in deciding whether the resulting product will be effective or just plain rubbish! Nowadays, and rightfully so, the emphasis has shifted to being natural and organic. Whether it be food or creams or shampoos, everyone wants natural products that are healthy and not packed with man-made agents. In saying this, there still is a need for a certain amount of science if the product is going to reach its peak levels. 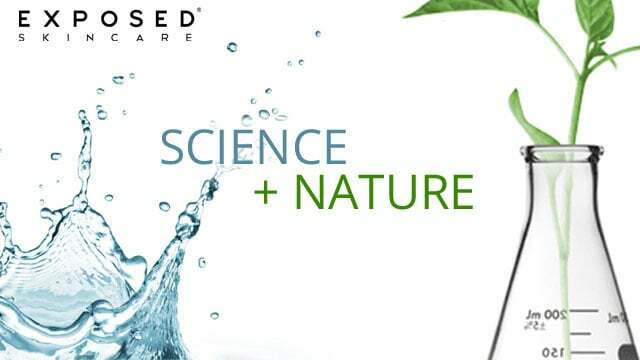 The trick is getting the balance right between nature and science – getting the best out of both sources. This is exactly what they have achieved in their acne treatment kit. 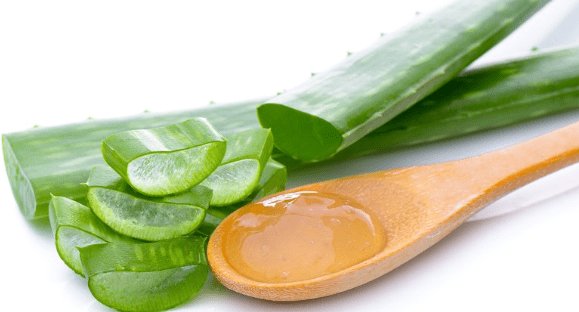 This ingredient has been used in health and beauty products for years now and is rightfully regarded as being one of the most effective natural agents available. Green tea extract works to attack the bacteria that causes acne vulgaris, doing a similar yet more natural job that benzoyl peroxide does. The combination of green tea extract and benzoyl peroxide therefore provides a two pronged assault on offending bacteria which will help to rid your face of this ailment once and for all. This extract is used to cure many ailments. In regards to our skin, passion flower extract works to soothe any irritation by providing inflammatory elements directly to the skin. Passion flower extract doesn’t actually treat acne, but rather it works to prevent it appearing in the first place or restricting more from appearing. This is another agent that is used in a massive amount of health and beauty creations. It works to soothe and moisturize the skin and works great to speed up the healing time of any facial affliction. This is vital as we all want to get rid of the physical presence of acne as soon as possible. Aloe Vera supplies this hastiness. All of these ingredients are included in the formula of this treatment-kit in some shape or form. As with all ingredients, it’s key that the volume as well as the inclusion is spot on, something that the people behind the scenes were clearly quite aware of when they were creating this product. I personally love licorice in sweet form so I always get a kick when I see this ingredient included on the back of a product. 🙂 This ingredient is extracted from the licorice plant and works as a topical application that reduces inflammation. The result of this ingredient is that the damage caused by acne is lessened as your skin’s complexion is boosted. This ingredient provides antibacterial properties that boosts the body’s natural defenses against the invading bacteria. It works to fight the pathogen and therefore is ideal in combatting a wide variety of bacterial infections. Check out our article on this particular oil and some other some beneficial Essential Oils. This ingredient works to actively kill the bacteria of acne both on the skin’s surface as well as deep within the pores. It also works to reduce the production of sebum/oil, something that directly leads to the bacteria spreading. This is the newest weapon in the war against this skin malady. It’s a mild acid that predominantly works on the skin’s surface to remove dead skin cells and excess dirt. It also unclogs pores and shrinks these pores so as to prevent future blockages and whiteheads. AHA also works on the outer portion of our skin to unclog pores in order to expose the newer, younger skin that lies beneath. It is also responsible for the production of collagen which is essential in strengthening our skin and making it as supple as possible. Sulfur works to absorb excessive oil/sebum which will have the double effect of unclogging pores as well as preventing existing acne from spreading. 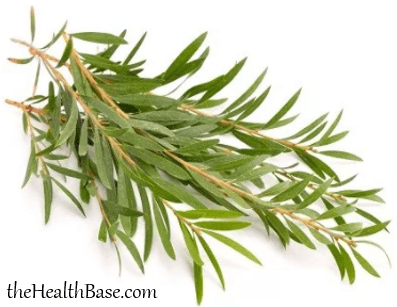 This ingredient is super effective when dealing with severe cases of this bacterial infection. This agent targets areas of inflammation with the aim of bringing relief. It also aids in the shedding of cells so as to negate the chances of accumulation. - After this, squeeze out a small amount of the cleanser onto either your fingertips or a face cloth. Personally, I like to use a face cloth as I actively avoid touching my face with my hands!! However, if you’ve properly cleaned your hands then there shouldn’t be a problem using them. - Gently work the cleanser into your skin with clockwise movements. This will create a nice lather on your face. Take care to not rub your face too hard or too fast – your pores are already open so there’s no need to use extra vigor. Simply allow the cleanser to do its work. - Leave the lather in place for 10-15 seconds, then you can wash it off with some warm water. Or else you can use the microdermabrasion cloth that’s provided with this kit. Finally, pat your face dry with a clean towel. Take a look at our Best Exfoliation Article where we go into detail of what the best techniques are as well as giving some top tips. - Next up is the toner, or clearing tonic as it might sometimes be called. This toner works as a secondary cleansing method and is great for those people who are suffering from bad acne or else who have excessively oily skin. - This is where your acne treatment kicks into fifth gear and the real magic begins to happen. As with the cleanser and toner, begin by squeezing out an economical amount of the serum onto your fingertips. - However, unlike the cleanser and toner where you used a clockwise technique to rub it into your face, instead dab the serum onto a few places on your face. Then gently rub these dabs into your skin. - Again, be gentle and slow when rubbing the serum in. You’ve already prepared your face for the serum so there is no need to add extra effort in rubbing it in. The serum has been specifically designed so that your skin will absorb it with ease. - Once you’ve fully spread the serum around your face, leave it for 5 minutes or so in order to allow it to dry in. TOP TIP: when rubbing in the serum make sure that you avoid the eye areas. I found that the serum can irritate the delicate skin around the eye sockets so it’s better to be safer than sorry! - Every time that you do any kind of treatment on your face, the best idea is to finish with a top quality moisturizer. 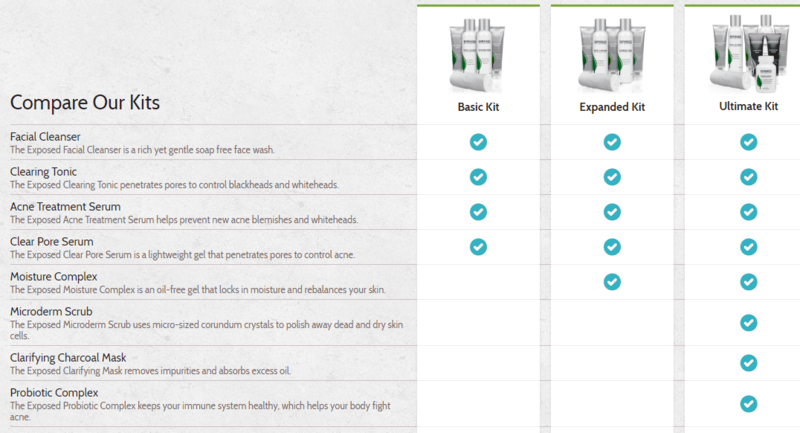 The Exposed-kit comes with just such a moisturizer and this is the final step in your treatment. - It’s essential to moisturize your face after using the other creams because your face will be lacking in hydration and nutrients. While the cleanser, toner, and serum will work miracles in battling the infectious bacteria, they can leave you face dry and in need of moisture. - So, to replenish your skin and restore it to its maximum vitality, rub a generous amount of the moisturizer into your face. A huge amount of people either ignore warranties or else the issue doesn’t even cross their mind. For the majority of products and purchases this isn’t a big deal. 99.9% of products will do what they promise and so there won’t be any need for a warranty or guarantee. However, every now and again, you’ll get stung. You’ll purchase something by mistake, or else something that is plain rubbish. This is when a guarantee or warranty will really become the most important thing that you own!! 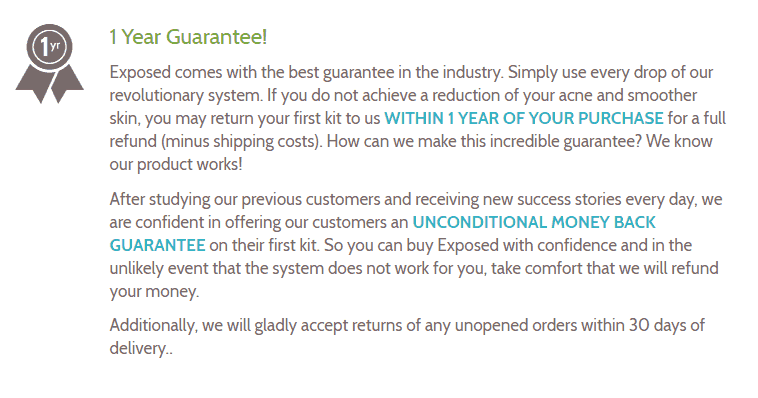 What’s great about the company is that they offer a full year in the way of a money back guarantee. This is exceptionally good in the niche of acne treatments as the majority of brands usually only offer a 60 day guarantee. To have a full year in which you can get your money back delivers that all important peace of mind! If you have ever shopped online, and there isn't many in the modern world that have not, then you’ll know that prices can shift and alter depending on the vendor. Shipping can also vary in terms of cost. I and the Health Base team have put a considerable amount of time into trying to figure out which online vendor gives the best deal when it comes to purchasing the brand's products. While things are always changing online, we think that we have indeed found the best priced source. Through the link below, you will be able to purchase this acne treatment kit for a very reasonable price - a price that will come down if you choose to avail of the autoship option. I personally use the autoship option as it means my orders are automated and I don’t have to worry about reordering. However, if you’re starting this treatment for the first time then I’d suggest that you buy the Exposed Kit as a once off purchase at the start – just so as to see how you find it. You can always activate the autoship option on your second purchase. There are other kits available as well so keep that in mind. I personally believe that the one I've reviewed is the best to begin with. Clear Skin + $25: this is a pretty nifty offer in which you can send this brand any empty bottle/tube of another brand that you've tried and didn't see results from. In return, you will receive $25 credit into your Exposed account. 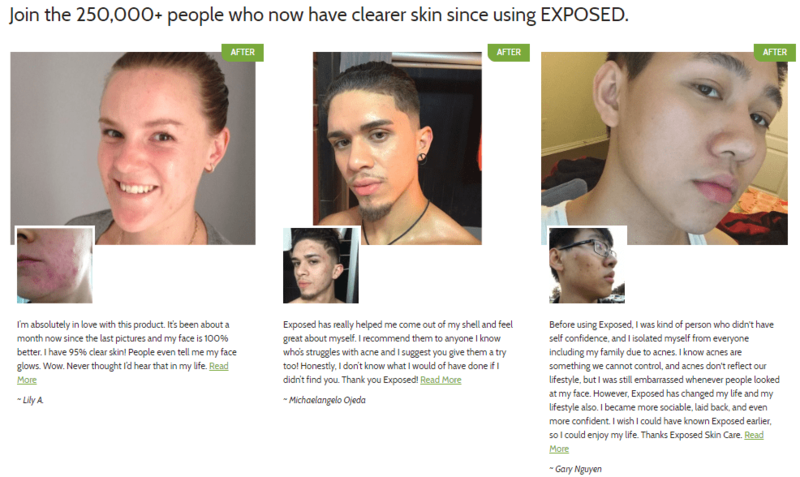 Ultimately this is a great way to start your new acne treatment virtually for free! How long does it take for this treatment to work? On average it takes this treatment between 2 - 5 weeks for the results to become evident. Does these products work on all skin types and ages? Yes. This is one of the great aspects about this product range - they can be used on all types of skin, no matter the age or tone. Can this treatment be used for acne scars? Indeed it can. This brand has taken special care to include into their products the ability to help reduce acne scarring. How often should I use these acne kits? It's advised that you avail of your home kit twice daily - once in the morning and once in the evening. Once you start to see results you can then reduce this to just once a day if you wish. 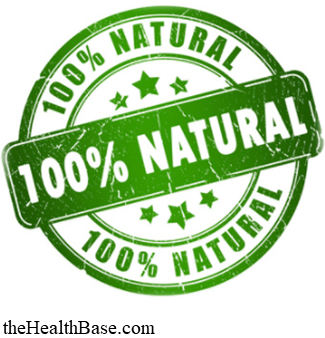 Yes the ingredients incorporated into this product range have been tested and certified by the FDA. I’m sure by now you’ve realized that I’m a big fan of this product! I’ve been using products by this brand for several years now and I only have positive things to say. I’ve really had no issues with their products, including the kit that I’ve discussed in this review. What I would say though, is that this product really works best for oily, sensitive, and dry skin complexions and severe acne sufferers. While it would be effective on other skin types, there are also other options out there. 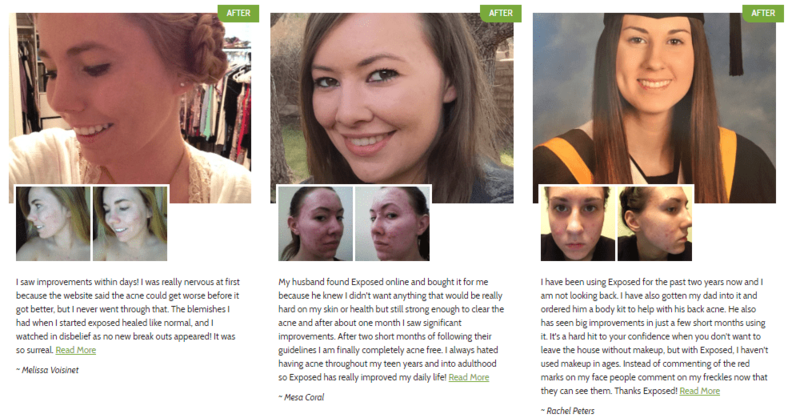 Such examples are the products created by AcneZine and ClearPores. Well there you have, ladies and gentlemen! 🙂 That brings to an end my review on the this popular skin-care product. I hope that you found it informative. As always, if you have any queries then please feel free to shoot me a message in the comment section below. I, or a member of the Health Base Team, will reply as soon as we can! P.S. Please feel free to browse our other posts on this topic. We will be continually adding guides, articles, and reviews on a regular basis.